Born in Brussels, Belgium, Georges Schreiber returned to Germany with his family after World War I. Educated as an artist in the French tradition of the peintre-graveur, he studied in the art academies of Elberfeld, Berlin and Dusseldorf, while making trips to the museums of London, Rome, Paris and Florence. Schreiber began work as a freelance artist in 1925 when he was hired by the Keolner Tageblatt, a daily newspaper in Cologne. After emigrating to New York in 1928, he conributed illustrations to the New York Times and the New York Post. 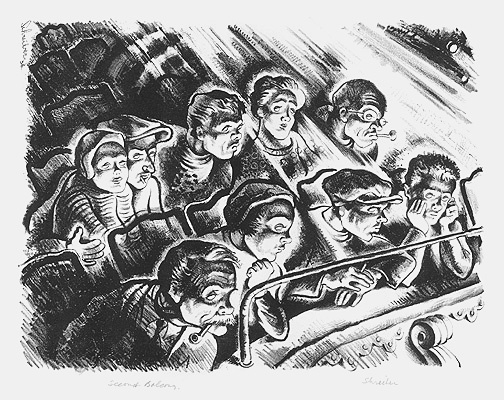 In 1936 he enrolled in the WPA Federal Art Project and over the next three years toured all 48 states, creating lithographs of American Regionalist imagery. A prolific print maker, Schreiber was also a painter, illustrator and watercolorist. He taught at the New School for Social Research and was a regular contributor to a number of national magazines. He also wrote and illustrated several books. Schreiber exhibited at the Carnegie Institute, Corcoran Gallery of Art, Pennsylvania Academy of Fine Arts, Art Institute of Chicago, Whitney Museum of American Art, Metropolitan Museum and the Museum of Modern Art  frequently winning awards. Museum collections representing Schreiber's work include the Metropolitan Museum of Art, Brooklyn Museum, Whitney Museum of American Art, and the Museum of the City of New York. Edition c. 25. Signed and titled in pencil in another hand. Signed and dated in the stone, upper left. Image size 10 3/4 x 14 3/8 inches (273 x 366 mm); sheet size 15 3/4 x 17 1/2 inches (400 x 445 mm). A fine, rich impression, on off-white wove paper, with margins (1 1/4 to 3 1/8 inches), in excellent condition. 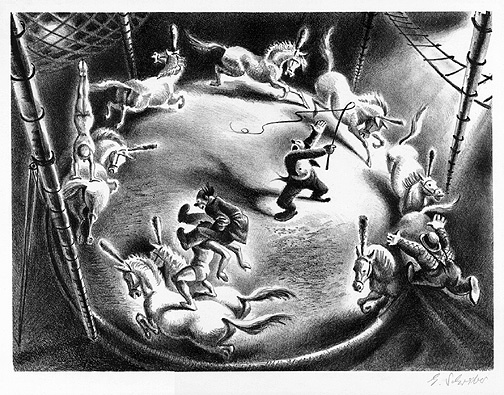 Illustrated in Works Progress Administration Masters: Prints from the New York Federal Arts Project 1935-41,exh. cat. Cornell Fine Arts Museum, Rollins College, Florida, 1989. 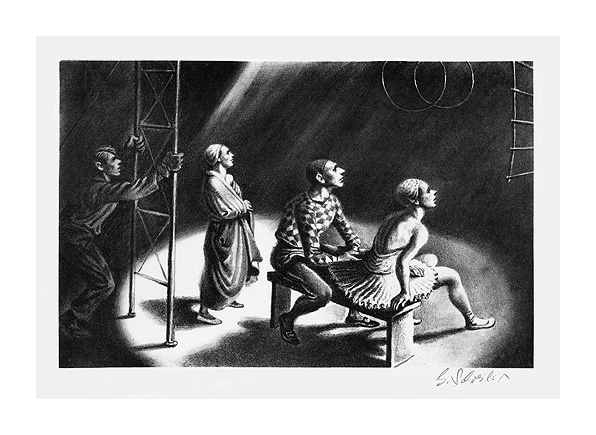 Without a Net-- 1944, Lithograph. Edition 250, AAA. Signed in pencil. Image size 8 3/4 x 13 5/8 inches (223 x 346 mm); sheet size 10 5/8 x 15 3/8 inches (270 x 391 mm). A fine, rich impression, on off-white wove paper, with margins (7/8 inch), in excellent condition. Image 9 15/16 x 13 1/4 inches (258 x 336 mm); sheet size 11 3/4 x 15 1/8 (298 x 384 mm). A fine, rich impression, on off-white wove paper, with margins (7/8 to 15/16 inch), in excellent condition.